How much does it cost to travel to San Jose? How much money will you need in San Jose? ₡27,950 ($47) is the average daily price for traveling in San Jose. The average price of food for one day is ₡4,779 ($8.05). The average price of a hotel for a couple is ₡33,179 ($56). Additional pricing is in the table below. These average travel prices have been collected from other travelers to help you plan your own travel budget. How expensive is San Jose? How much money do I need for San Jose? 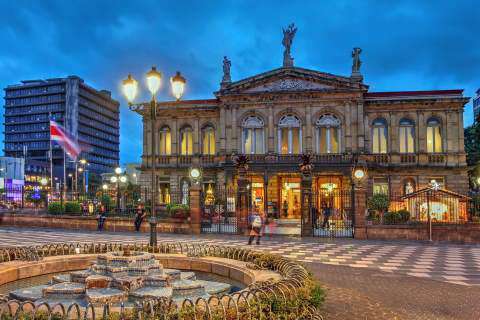 San Jose is the capital city of Costa Rica and is likely to be your first and last stop in a visit to the country. The city is situated in the Central Valley and is surrounded by beautiful mountains and valleys, making for a beautiful flight in. The city has an elevation of 1200 meters and sits on a plateau with a beautiful backdrop of lush green forest. Half of the people in Costa Rica reside in the country's capital city. You are likely to stay only a day or two, but there are a handful of things to do and see including museums and markets. You will also find many embassies, as well as the University of Costa Rica in San Jose. San Jose is located in the Tropics within a tropical rainforest, but it's higher elevation gives it a mild climate. Technically, the climate is considered tropical wet and dry. The average highs are in the high 70s to low 80s Fahrenheit year around. The lows are typically in the mid 60s Fahrenheit. The rainy season is between May and mid-November, but the weather can be overcast even during the dry season. There are a handful of museums throughout San Jose that are worth visiting if you have the time. These include the National Museum, the Gold Museum, the Jade Museum, the Children's Museum, and the Insect Museum at the Universidad de Costa Rica. Other nearby places to visit include the butterfly farm, the coffee farm, and La Paz Waterfall Gardens. It is also possible to book a tour within San Jose, or organize a tour throughout all of Costa Rica. San Jose is divided into 11 districts. These are Catedral, Carmen, Hatillo, Hospital, Uruca, Mata Redonda, Merced, Pavas, San Francisco de Dos Rios, San Sebastian, and Zapote. These districts can further be divided into specific neighborhoods, or barrios. The downtown area includes the districts of Catedral, Carmen, Hospital, and Merced. The Hospital and Merced districts are where you'll find the main commerical activity of the city. Catedral is named for the Cathedral and the Catholic Archdiocese of San Jose, which is located there. If you have enough time, a great day trip from San Jose is a visit to Poas Volcano. The volcano is stunningly beautiful with an emerald green crater lake. Do make sure the weather is clear on the day you head to the volcano as a cloud cover will completely block your view. It's possible to catch a bus from San Jose to Poas at Parque La Merced. It leaves every day around 8:30 in the morning and it is easy to make a return trip the same day. Other activities that you can enjoy around town include yoga classes, sporting events, and visits to hotel casinos where you can try your hand at gambling. If you happen to be in town on a Thursday, then head to the Parque Morazon where you can watch dozens of jugglers perform to percussion music. It's a fun local event and you may even be asked to join in. Like most places in Costa Rica, the most popular food around town is the national dish of gallo pinto. This is a mixture of fried rice and black beans and usually served with tortillas and sour cream. Casados is commonly available for lunch and dinner. This dish includes rice, beans, and meat, and is served with a cabbage and tomato salad, fried plantains, and tortillas. If you're looking for a great place to grab a cheap and quick bite to eat, head over to Mercado Central. It's an old food market but you'll also find a handful of smaller restaurants. You can also pick up some fresh fish or other meats. There's a wide variety of local specialties including ceviche, corn based dishes, and cinnamon flavored ice cream. San Jose is served by an international airport which offers connections to major airports in the U.S. and other convenient locations. This means that you can get in and out quickly. Therefore, San Jose makes a great hub for planning any of your Central America itineraries for the entire region. The best way to travel around San Jose is by taxi. They are generally quite cheap and every taxi should have a meter. It is best to confirm that the driver is using their meter before you begin the trip. Walking in San Jose may be hazardous as pedestrians don't typically have the right of way. Make sure you watch for fast moving cars and motorcycles when you cross busy streets. There is a bus network that is run by several private bus companies. The network connects much of the city with the suburbs, and there is a bus service between Juan Santamaria International Airport and downtown as well.